Essentials , SPRING / SUMMER 2017. 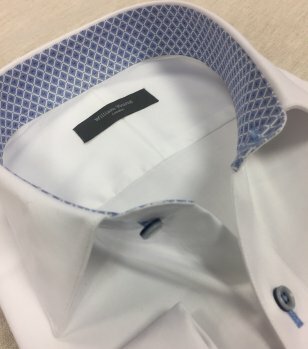 The ultimate tailored garment is achieved using the tailors unique skills and expertise combined with a fine blend of perfect fabrics and raw materials. 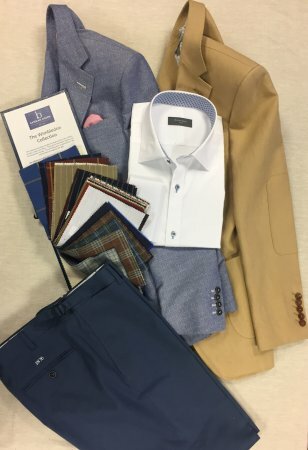 Working together with some of the best fabric mills and Merchants around the world William Young (1876) have access to the best collections available to help you create the perfect Spring Summer wardrobe. A classic Cotton or Linen jacket is a must for this summer, the ‘Wimbledon Collection’ created by Bateman Ogden is but one of the options available. This collection has been produced using only natural fibres with yarns that have been used by man for thousands of years. The range offers the latest contemporary shades as well as more traditional and timeless classics. Cottons and linens are extremely comfortable to wear and offer the options of both formal and more casual tailoring. Keep the lapels wide and the shoulders natural, pockets straight and uncomplicated. Commuting or travelling abroard? Keep that sharp appearance throughout those warm summer days from early morning to late evening. At William Young 1876 we will guide you through a selection of fine high twist wools and beautiful mohair and kid mohair fabrics. The high twist yarns are perfect for warmer climates as they wick moisture away from the body, keeping you cool and dry. High twist fibres are durable, breathable and comfortable to wear and in addition they resist excessive creasing. High twist fabrics make the perfect travel suits.The silhouette should be sharp, clean and without fuss. A more natural shoulder line is great for summer but keep some classic features, such as side vents and straight pockets with flaps. If you don’t open the flaps your suit will keep its sharp appearance. Lapels can be notch or peak but avoid the ‘skinny lapel’ at all cost. Bring your suit alive with a tonal pocket square and hand made button holes. Trousers should be contemporary in style with a 40cm - 42 cm hem width , not skinny and definitely not wide. Our extensive range of luxury suitings from selected mills and merchants include, Loro Piana with the exquisite Italian wool silk collection ‘Royal Wish’ and Travel line. The superb ‘Condor’ cool wool collection exclusive to Scabal and the fine wool and kid mohair collection ‘Piazza’ from Brook Taverner. To compliment the beautiful suit and Jacket offer the shirt range should not be over looked. Fabrics developed for the man who crosses boundaries with style in the board room striking, immaculate, distinctively personal and always ahead of the trends, Egyptian cottons and Pure Linen or silk blends are essential. If a tie is to be worn select a more square collar shape, without a tie a classic cutaway creates a more European look. Think about a contrast fabric for the internal collar band and inner cuff but avoid contrast external collar and cuffs unless you want a more traditional city look.